Someone said it to me a few days ago, "It's a boring world, everywhere is the same. Men like to sensationalize in writing, women likes to indulge to dubious relationships." 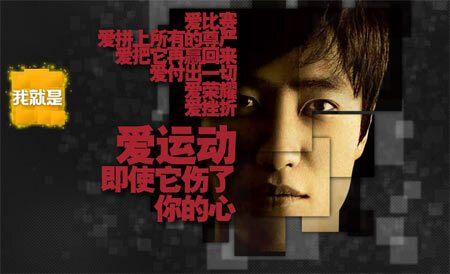 Come to think of it as the reaction to Liu Xiang's withdraw swirled, that claim captured only half the truth. There were many "Literacy Youngsters" on douban who were quick to their sensationalist style, but there were also plenty of "Angry (disgruntled)" on Tianya forum. Disgruntled is the yin to Sensationalist's Yang; radicalism goes both ways. But the Chinese press seems to forget the ancient Chinese wisdom. And Thomas Boswell of Washington Post may never understand. Boswell, on the basis of some disgruntled internet posts, described the Chinese as inferior cruel mobs (remember Cafferty?) who piled on their fallen hero. The sudden drama of Liu Xiong's pull-out had wide spectrum of reaction across the internet. Most voiced support; some questioned whether pulling out was a pre-determined decision; others had a hard time understanding why it had to come down to a decision on the starting block. Let's read some Olympics press coverage, shall we? Micheal Phelps got eight gold, and New York Times had a whole column dedicated to it, discussing whether that was the greatest Olympic achievement. We were all capable of enjoying the sensation. When I turned to Sina, it had a full special page dedicated to Liu's withdraw, trumping the eight-gold-treatment. The U.S. Had also someone who didn't finish the race, although not on the starting block. Trammell pulled his hamstring in the same round and had to pull up. He got mentioned by NYT only in passing in the article covering Liu Xiang. Lolo Jones, with her unique story, was sympathized in an article. The media non-corporation award went to Tyson Gay. NBC reporters kept giving him cue on how he was injured leading up to the event, but he insisted he was fine, just "did not get it done". Flip to sina, there were reports that Liu was running 12.96, 12.98 before the race, or more precisely, withdraw. A CCTV reporter even mention she has inside information that Liu was running close to 12.80. The numbers varied. I didn't know which one to believe exactly. But nevertheless, "Beijing Olympics should have belongs to him", as the reporter proclaimed. There had been enough media frenzy about Liu's tragedy, most unanimously sunny, or humane as someone liked to say. (I'm quite tired of seeing the word "humanity" in Chinese press nowadays, as if the China I've lived was inhumane backward doldrums.) Liu might be fallen, but "did not “lose.” Perhaps to counter charges from the likes of Boswell, there were even reported rumors that an order was given, forbidding the country’s news media from criticizing Liu. A hero was intact. With all this "yang" in the official media, it was not surprising to find "yin" of different voices in unofficial forums. BBS itself had been the "yin" to the official media's "yang". Together, we had "qi" of a harmonious society - joking. But whether in support of sensationalized tragic narrative or being disgustedly suspicious, it was all in accord to "one world, one dream". I have watched Liu Xiang four years ago. He was flamboyant on camera after the surprising win, but I liked it. It was spontaneity. And I marveled. Now four years after, I felt the sadness watching him pulling out. Liu was not on camera immediately afterward, he issued an apology - it's not like he needed to. His apology came out the same time Nike tweaked its ad campaign featuring liu. The words on the poster read:"Love competition. Love risking your pride. Love winning it back. Love giving it everything you’ve got. Love the glory. Love the pain. Love sport even when it breaks your heart." I couldn't help but thought of the word: PR. What about the "women likes to indulge to dubious relationships" part, you may ask? Well, isn't it obvious by now? The counterpart is that men are not courageous enough.